Este artigo é sobre the battlemage in the Mages Guild. Para the Blade, veja Roliand. 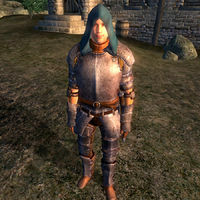 Roliand Hanus, an Imperial battlemage, is an Evoker of the Mages Guild. Together with Arielle Jurard, he is working undercover at the Brina Cross Inn to investigate a series of murderous assaults on traveling merchants along the Gold Road. He only appears after Stage 40 of the related quest. After you have spent the night at the inn, he will be found patiently waiting for you outside, and will then tag behind Arielle Jurard to offer you even more backup. When Caminalda makes her appearance, he will attack her and may be slain in the process. If not, he will stay behind and watch over her dead body until you talk to Carahil and complete the quest. At this point, he is disabled and will disappear from the game. He is armed with an almost complete set of iron armor: all but the helmet, which he compensates for with a standard mage's hood. His only other possession is a meager amount of gold. In combat, he relies on a steel war axe and on a leveled set of Destruction, Illusion, Restoration, and Summon spells. He is a mage of very few words, and his only comment to you when you approach him will be: "It is ill-advised for us to speak." Anvil Recommendation: Investigate a number of deaths along the Gold Road to obtain a recommendation from Anvil. Esta página foi modificada pela última vez à(s) 09h47min de 1 de janeiro de 2014.